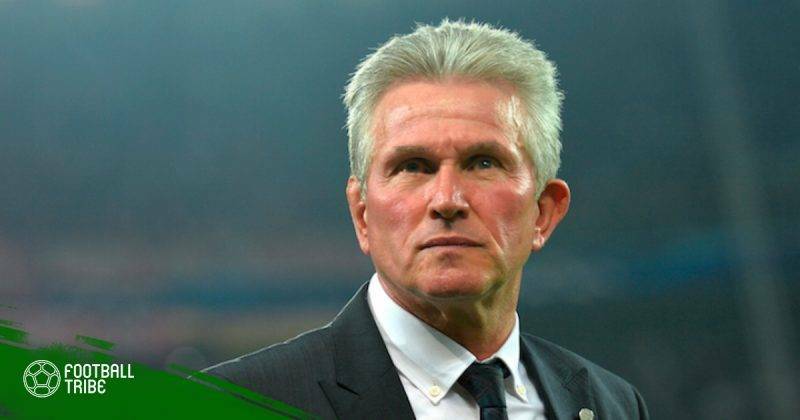 Though being eliminated from UEFA Champions League 2017/18, Bayern Munich’s manager Jupp Heynckes once again proved he was one of the sharpest tactical masterminds in football. Die Roten was eliminated because of personal mistakes and poor finishing, not because of the way Heynckes field and ran the team. Injuries forced Zinedine Zidane và Jupp Heynckes to make certain changes with their starting line-ups. In the visiting team, Boateng was replaced “1-1” with Nikals Sule; but up front, it takes more than just any one man to fill in the shoes of Robben in the right flank. Thomas Muller had to play wide on the right, while crossing is never one of his strengths. On the left, Riber was picked; James Rodriguez, on his return to Santiago de Bernabeu, played at his favourite position, right behind Lewandowski. In the midfield, Heynkes surprisingly pick Corentin Tolisso instead of Javi Martinez. Thiago tended to play deep when defending to ease the pressure on Sule và Matt Hummels. On Real Madrid side, Zinedine Zidane had to use Lucas Vazquez as a temporary solution for Dani Carvajal at Right Back. As a result, Modric had to play more toward this right flank to support the youngster, as the combination of Ribery and Alaba is theoretically too much for any defense, let alone one single young defender. Real Madrid is vulnerable in defense this 2017/18 season. It was proved throughout the La Liga campaign, or the most recent defeat in the UCL against Juventus. It happened again! Marcelo was tracking the movement of Muller, who was playing wide. That opened the door for Kimmich to freely penetrate the left side of Real Madrid; and after the horrible clearance from Sergio Ramos, the remaining job is quite simple for the German Right Back. Even though the goal was conceded from the left flank, Madrid’s main trouble was not Muller, not Kimmich or the position of Marcelo. It was the opposite flank where they were most vulnerable. Instead of a diamond shape formation as usual, Real Madrid had to play 4-4-2 flat with four midfielders almost on the same line. Modric played deep on the right to support Lucas Vazquez. Bayern’s three-man midfield (James – Tolisso – Thiago) then had the chance to dominate just two players from Real (Mateo Kovacic – Toni Kroos). With the dominance in midfield of Bayern, Matt Hummels was free to show his ball-making ability from the back. 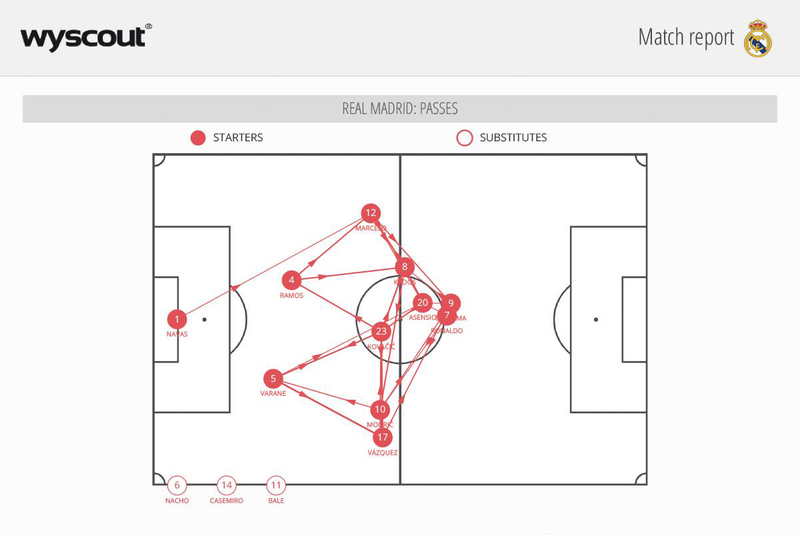 Most of Hummels’ passes put his teammates on a position to roam forward. The intention in every pass was to attack. Alaba and Ribery put tremendous pressure on the left, Tolissso – James – Thiago dominated in midfield, Matt Hummels leading attacking plays from the back. It was easy to understand how Bayern controlled the game and ball possession. One thing that not even a mind of Jupp Heynckes can calculate: personal mistake. The disastrous slip of Ulreich and the droughts of Lewandowski – Thomas Muller were proved to be crucial. If Ulreich’s dreamy moment caused a conceded goal, Lewandowski and Thomas Muller’s absences made Bayern attacks worthless, no matter how well they were built up. Should only one of these two things do not happen, the result could have been very much different. Sergio Ramos “pocketed” Robert Lewandowski completely. Besides the bad clearance that led to Kimmich’s opening goal, Real Madrid’s captain played so calmly (no foul during the whole game), resolved all troubles from the Poland forward (with triumphs in five head-to-head battles). 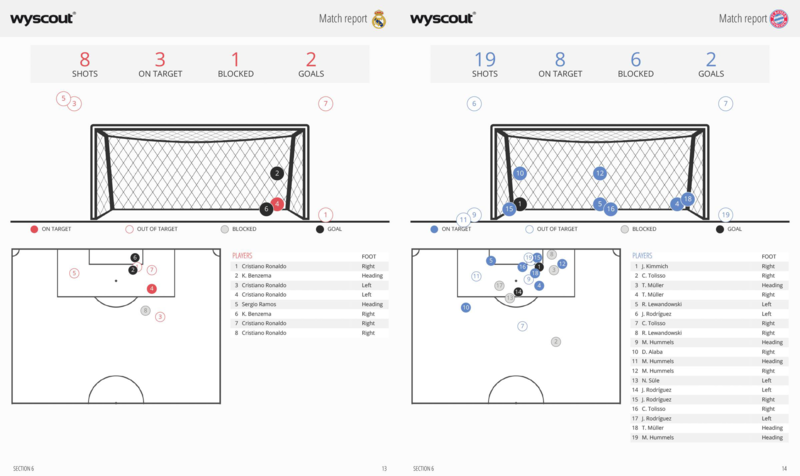 According to Whoscored.com, Lewandowski could only shot three times, with two on target and blocked by Keylor Navas. In the first leg, Muller was invisible: zero successful dribble, one off-target shot. 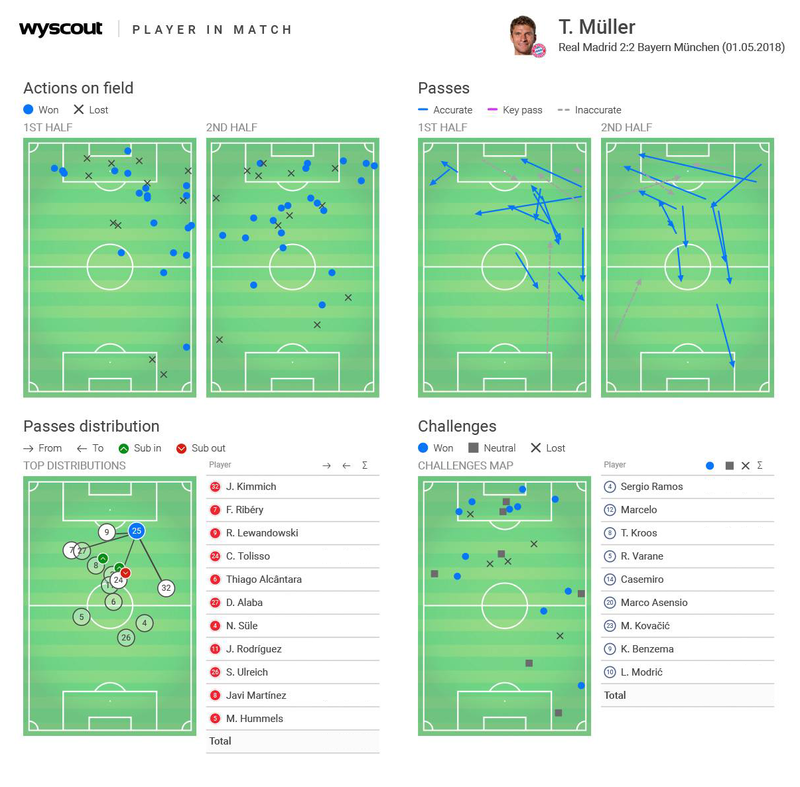 In the return leg, playing wide on the right in the first half and moving inside in the second, Muller couldn’t even have a dangerous pass. Playing as a playmaker, his accurate pass ratio was only 74%. More terribly, the Raumdeuter only achieved 50% pass accuracy with upward passes. Playing as one of the three men upfront or partnering with Kimmich on the right, all that the number 13 can do was one pass into the opponents’ 1/3 area. Zidane picked Mateo Kovacic to play vertically, instead of using Casemiro who tended to sweep the midfield horizontally. “Kovacic was the one I chose for today’s game. We know he gives us something different, breaking through lines with the ball. Sometimes one guy plays, other times someone else gets a go. The important thing is that we’re in the final” – Zinedine Zidane explained about his decision to start Kovacic instead of Casemiro. Real Madrid started with a 4-4-2 formation with 4 midfielders on one line: Asesio played on the left with the intention to move inside to feed Cristiano – Benzema up front. Luka Modric played wide on the right to support Lucas Vazquez in defense. Mateo Kovacic and Toni Kroos formed a defense to protect the back four. 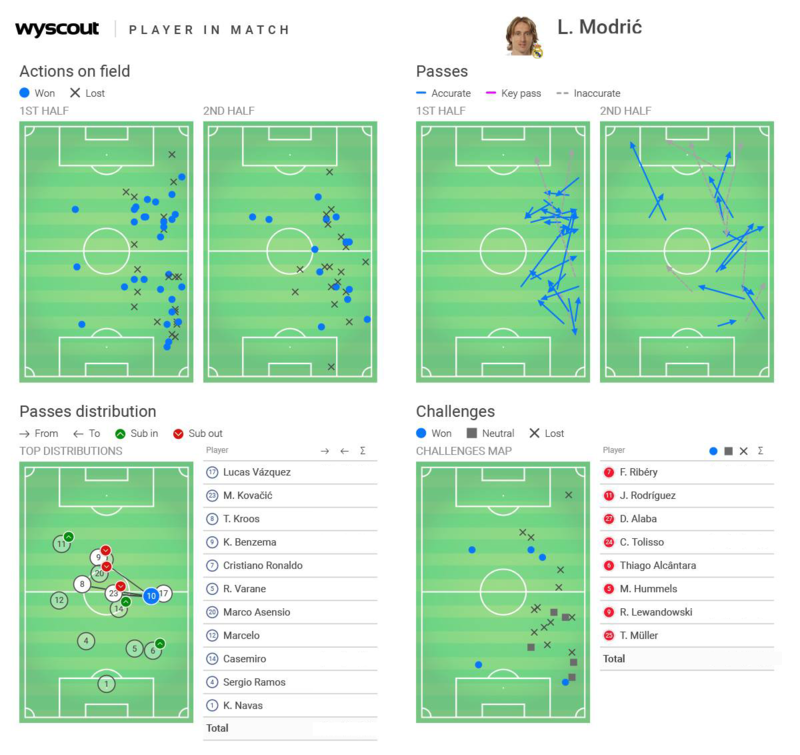 The numbers of passes that Luka Modric passed to/received from Lucas Varquez were the most obvious evidences that show Zidane’s clear instruction for the Croatian to support Varquez. Moreover, the number of tackles Modric made on Frank Ribery are the highest among the team, which clearly showed how Zidane wanted to carefully guard Real’s right flank. 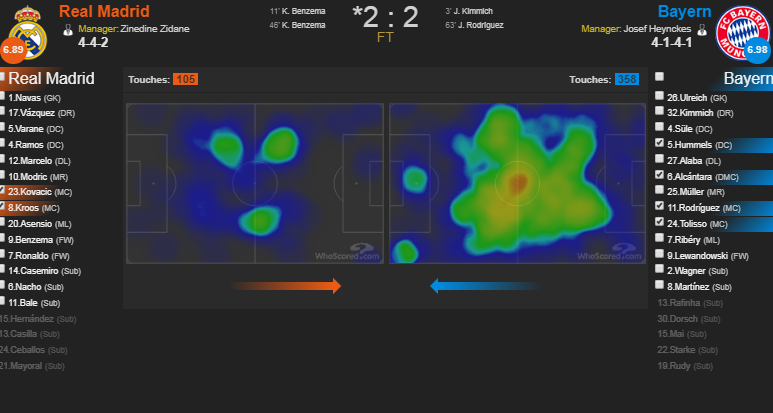 Whoscored’s heat map showed that Bayern’’s midfield with Tolisso – James (playing towards the left to support Alaba – Ribery) – Thiago teaming up with Matt Hummels caused Mateo Kovacic and Toni Kroos unable to organize attacks vertically. While Modric supported Vazquez, Zidane let Mateo Kovacic play as “the heart” of Real Madrid. The young midfielder played his part in distributing the balls, “pumping blood” to his teammates. 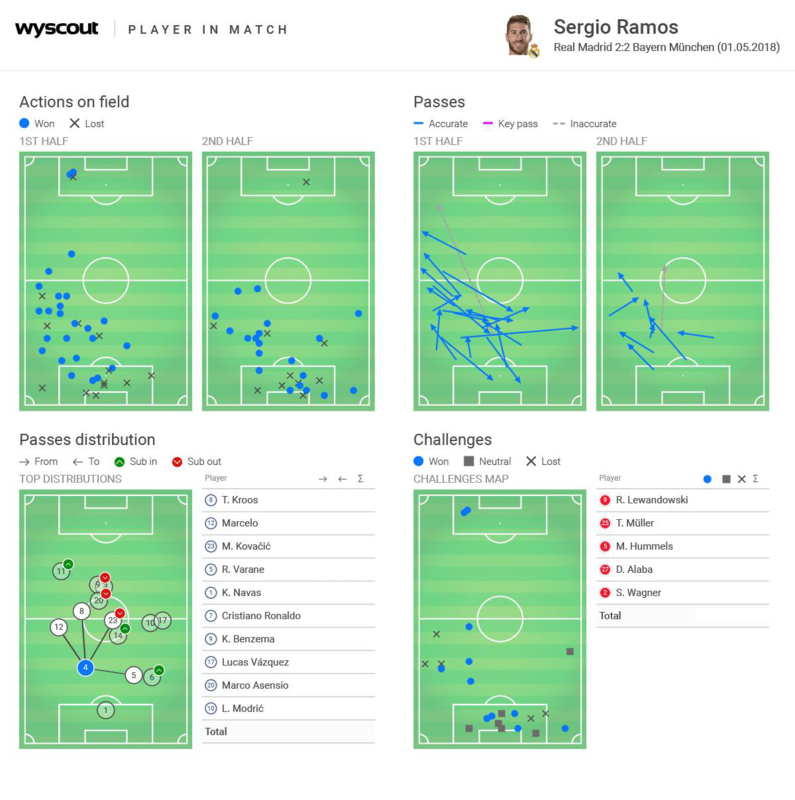 Being surrounded and pressed by Tolisso – Thiago, Kovacic gradually lost his communication channel with Marco Asensio (he only made on direct pass to Asensiso). Most Kovacic’s passes were heading to Modric or Toni Kross when Real in possession. Of course, we had to mention Keylor Navas, who played the game of his life. However, Bayern Munich forwards should be questioned with no goal in both legs. Interestingly, after 19 shots, those who scored are Kimmich – a defenders and James Rodriguez – a player on loan from Real themselves. Jupp Heynckes deserved more. He overcame the injuries of Arjen Robben, Neuer, Vidal, Alaba (in the first leg). He maximized the strengths of the squad and exploited Real Madrid’s weaknesses. In a way, he was betrayed by those who he entrusted. Bayern Munich players were to blame when they could not repay their leader in his last season before his farewell with the game of football.